← Science has great news for people who read actual books, but bad news for those who read online. Mashable has Lance Ulanoff’s first person account of what it’s like to drive a 3-D printed car: “singularly awesome!” The Strati, made by Local Motors, has leather seats, Bridgestone Battlax (motorcycle) wheels, a small Renault Twizy electric motor and a 120 pound battery, but only 49 total parts. The largest part is, in fact, the 3-D printed plastic body. Even though this is a printed car, it doesn’t give the impression of a kit or even cheaply made automobile. The leather-clad steering wheel feels solid in my hands. There’s a tiny dash display for speed and nestled to the left and somewhat behind the steering wheel is a set of three buttons with the letters DNR. D is drive, N is neutral and R is reverse. I note blinker controls on the wheel column, but not a lot else. 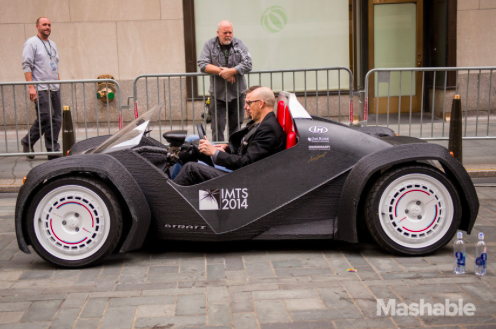 Let me repeat: I drove a 3D printed car. It wasn’t for long, and it wasn’t far, but it was a singularly awesome experience. Check out the Mashable article, which has a movie, some photos and a lot more details about the car. This entry was posted in 3-D Printing, Innovation and tagged 3D printing. Bookmark the permalink.